Knee is the largest and most complex joint of the body. There are 4 primary ligaments (with their muscles and tendons) and secondary ligaments for the knee to function properly. Here are the ligaments of the knee : there are 2 ligaments on the side the medial collateral ligament (MCL) and the lateral collateral ligament (LCL) and two crossed ligaments in the center of the knee, the anterior cruciate ligament (ACL) and the posterior cruciate ligament (PCL). 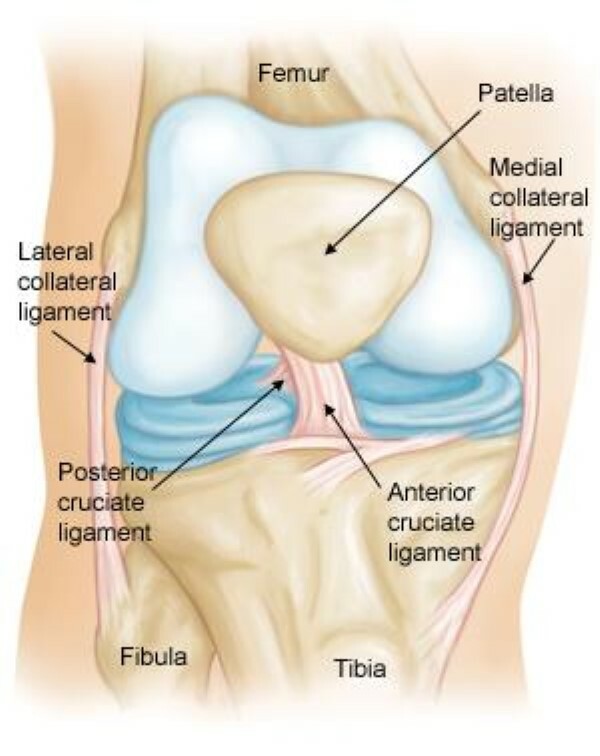 Anterior cruciate ligament connects the front top part of the shine bone to the back bottom part of the thigh bone and keeps the shin bone from sliding forward. The injury can be done because of a direct hit on the knee, which often happens in team sport. The injury can be done without contact with an object in a situation where the knee forced to be in a abnormal position, which causes a tear in one or more ligaments of the knee. Or when an athlete in the race change direction. Or when an athlete make a hyperextend of the knee when landing a jump, which often happends in agility sports. 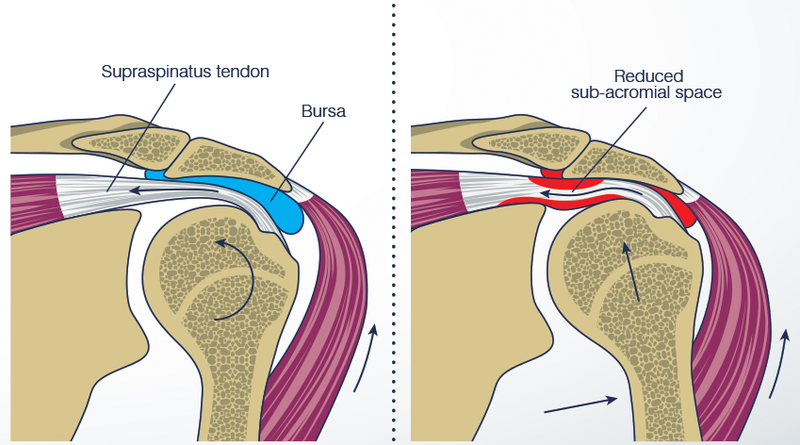 In the majority of cases, the doctor is able to identify what is the injured ligament. But the knee can also be injured at the joint on the surface and in this situation, it’s more difficult to diagnose because of knee swelling. To make an accurate diagnosis, it will be necessary to use a MRI scan or arthroscopy. 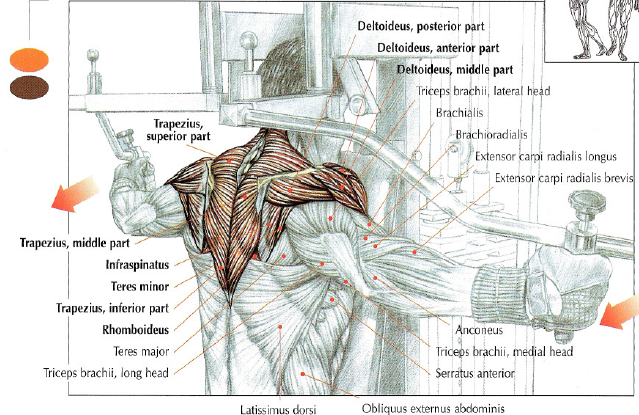 There are several fast, powerful movements that lengthen (eccentric phase) and shorten (concentric phase) a muscle. These prevention programs are for injuries without contact. These exercises are to improve the nerves/muscle control of the knee. These prevention programs use plymetrics, balance and strength/stability exercises. It’s a fast, powerful movement that lengthens (eccentric phase) and shortens (concentric phase) a muscle. 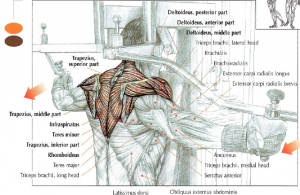 The concentric phase increases the muscle power. Here is an example, an athlete who jumps from a box and immediately jumps into the air after touching the floor. Balance exercices are done with the wobble or balance board. It’s also possible to perfom exercices by throwing a ball with a partner while balancing on one leg. To improve single-leg core strength and stability, there are excellent exercices such as jumping and landing on one leg with the knee flexed and momentarily maintaining this position. 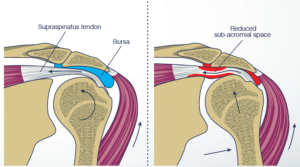 In the past, there was a technique that consisted of stitching the ligament together but it was rarely successful. 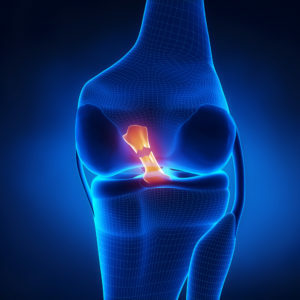 Currently, the technique involves reconstructing the anterior cruciate ligament by building a new ligament from tissue taken from one of the other tendons around the knee or from on organ donation. This tissue passed through drill holes in the thigh bone and the shin bone, and then ancored in place to create a new anterior cruciate ligament. Over time, this transplant becomes mature and becomes a new living ligament in your knee. Rheabilitation of the knee after the reconstruction of the anterior cruciate ligament requires time and work. To have a complete function, this can last between 6 weeks and 6 months depending on the severity and level of activity. Rehabilitation rate may take time depending on the specific requirements of the sport/physical activity of the individual. 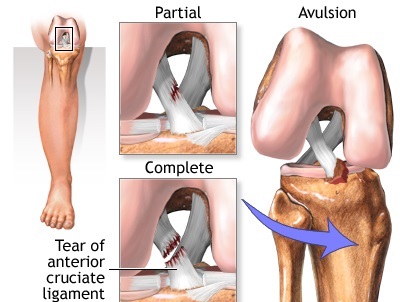 The overall success rate of the anterior cruciate ligament surgery is very good. A lot of study show that more than 90% of patients are able to return to sport without symptoms of knee instability. 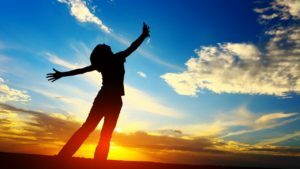 It’s true that some patients complain of stiffness and pain after surgery, that is why it’s necessary to make an aggressive rehabilitation until the new surgical technique to reduce these problems. Female athletes participating in basketball and soccer are 2-8 times more likely to suffer anterior cruciate ligament injury. Athlete who suffer anterior cruciate ligament injury at increased risk of arthritis development later in life.